I have had a tummy bug all week and have been housebound. Target has reacted by becoming the snuggle cat. He accompanies me on my dashes to the bathroom. Even when he's been roused from a deep, deep sleep in the middle of the night my kitten is there for me without a murmer of complaint - and with a meep of compassion. Au knows I'm feeling lousy so he lets me cuddle him. A privilege I appreciate. But our senior cat has his limits. As I haven't been able to get to the market (or the bank or post office for that matter!) we ran out of chicken yesterday. This is Au looking annoyed at the inconvenience I'm causing him. We can't order him take-out because Au has strong views on what is acceptable. He is not fond of processed chicken meat and he doesn't like chicken that's been dunked in boiling water and then roasted. Seeing our senior cat is getting very short-tempered, Tom ran out to buy him some chicken. It's now roasting in the oven. And this here is our friend Girl. She is a darling but getting rather prosperous around the middle. As such she is the star of this week's Dog Talk column, out tomorrow in the print version of the Malaysian national daily The Star Weekender section. Check it out! 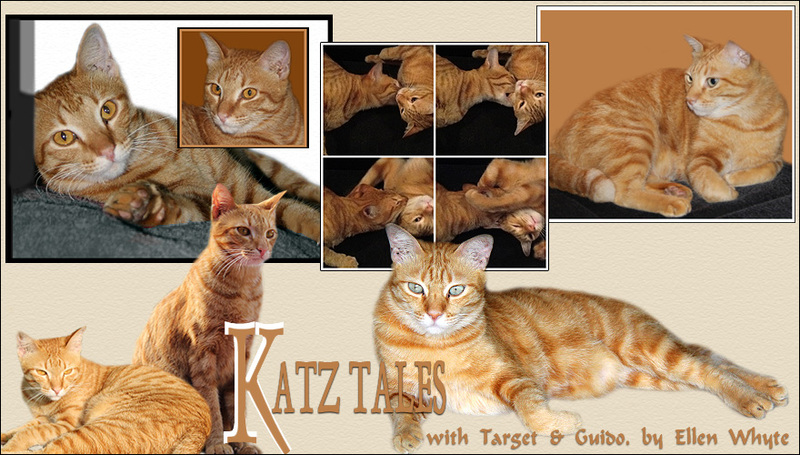 About the Katz Tales book: it is being published by Marshall Cavendish and will be sold in Malaysia, Singapore, Brunei and Hong Kong. I'll give you more details as I get them. Soooooo excited! That is so sweet of Au and Target! Feel better soon. Poor thing. I have tried feeding our Twyla slices of chicken, she threw up. So we quit doing that. After two months, she has adapted to eat wet and dry cat food. I am also excited for you. Looking forward to the details. We hope you feel better soon! That is not fun to be feeling sick!